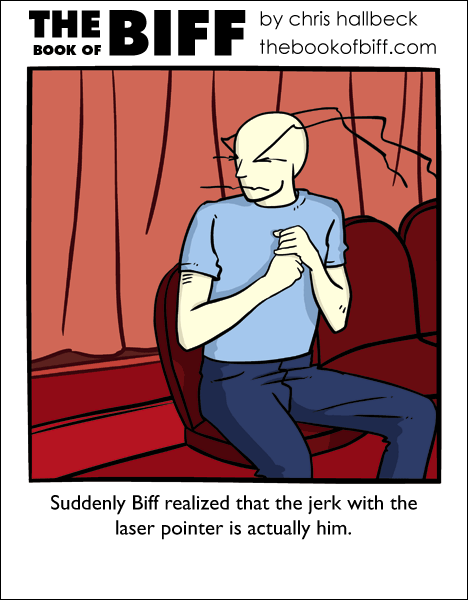 There was a period of time where it seemed that every movie or school assembly or concert I went to had some jerk with a laser pointer being a jerk. Fortunately it has been awhile since the last time I have seen that happen. Now I mostly see them used to torture cats and dogs. I’ve had a few questions about the cover for book #2. No that is not the final cover. 🙂 I’m still working on the finished version. It will probably be done this weekend. Meanwhile, head on over to the store and join the pre-order party! I have a lazer pointer key chain and when ever the chain rattles my cat comes running over thinking we’re going to play. I teased my cat with a lazer pointer for half an hour once. She then spent the next three days looking for it. once. He gave me a blank look. I don’t know about torture. My cats all love to play with the bright red dot, chasing it around the living room. Only problem is the rare times they run into each other. they should have a fine mist in the cinema, so it would highlight the path to the jerk. I would’ve thought that the small metal cylinder in his hand would’ve been a dead giveaway, but this is Biff we’re talking about. Aww…Biff goes to the movies alone? there were jerks doing that when laser pointers were new. now they’re not new anymore, so they’re not novel, so it’s no longer fun to be a jerk with them. there should be no more jerks until some new novel device that has the ability to annoy people comes out and becomes popular. Sometimes, those jerks with laser pointers are merely sound techs like me trying to aim the projector remote properly. But most of the time, it’s just plain jerks. @Micah: there’s nobody else in his world. either that, or everybody fears him too much to be seen in the same rectangle as him. Laser pointers are for cats, not theaters. My cats go insane for the red dots, not so much the green dot lasers. Me thinks that Biff needs to get himself a girl. I had a teacher once who used a laser pointer to point at things on his slides and stuff. Then one day half the class brought in laser pointers to annoy him. He was actually pretty good natured about it. This guy also ate a live cicada for us in class the year we had the 17 year cicadas buzzing about, so I question his sanity. @ghostmaiden – She’d have to be one seriously dedicated girl, to put up with all the stuff that goes wrong around Biff. There was once a guy in a presentation who kept pressing the wrong button on his laser pointer, but didn’t realise it even though he could clearly see that there was NO red dot on his slides. He kept on with it, though. Acting. Heh. @R. A. Maybe someone who is just as zaney as Biff? Liff, perhaps? My cats love chasing the dot created by laser pointers. Madness does happen in my house once a laser pointer is on the premises. My sister has a laser pointer that seems to be made for cats. one of the pointer images is of a mouse. One time the cats realized that the light was coming from the thing in my hand and tried to get it from me. They forgot it by next time. Also, the aquarium in Boston has a laser-pointer type thing that’s white and shaped like a fish. It’s there so you can make the penguins chase it. I always thought that was awesome, but kinda cruel. My cat knows where the laser comes from, but he doesn’t know exactly what the pointer is, so if I can just get a pen or marker that’s about the right color and size he immediately starts jerking his head around looking for the dot. I just realized how lucky they were when I was on a school trip to London. I was 18, had just got my first laser pointer, was enchanted with the wild feeling of freedom and irresponsibility that accompanies travels abroad, and I was enormously unimpressed by the Rocky Horror Show we had to endure, but I still kept the laser pointer turned off. Torture? My cat loves the laser dot. It’s especially fun to watch her try to climb the walls to get it. The fish in my brother’s aquarium follow it too. hehehe….wish I had one, never had one before. Nothing like cats and laser pointers… good times. my cat thinks the red dot is going to eat her. she doesn’t recognize the pointer itself but when that red dot magically appears she hides and gets really confused when her brother tries to eat it. Every cat loves it! But almost all of them know where the dot is coming from. They still hunt it, though. One of my cats didn’t know the secret and tried to eat the dot. If you turned the light off right at the moment of her jaws closing, she would chew the air for a couple of seconds. laser pointers are awesome cat towys. Lightwave Amplification by Stimulated Emission of Radiation.